Get your artwork checked, fixed and edited by our professional designers so you can view an online proof before you print. Need more info? Read our FAQ. Which product or size are you printing? Is there another size or printing product not listed? How many Kinds/Sets of artwork are needed? Different names on business cards would require 1 Kind per name. Each Kind needs its own Proof fee to Check, Fix & Edit. Select your artwork file(s) that need a Check, Fix & Edit. Max 5mb per file, or you can upload bigger files at the end of this form. File types we accept. Remember that you only get 1 proof, so please be specific & detailed. See which edits are acceptable? Where can we email your proof to? We can accept bigger files, and more of them in our Dropbox. What does an Artwork Proof include? If your artwork request will cost more than the basic $29, then you will be quoted upfront so there are no surprises. Do I need a proof? You can order an optional proof when ordering your printing. If you are confident that your PDF artwork is “print ready”, and doesn’t need to be checked or fixed, then you may not require a proof. This option is FREE, and you will not be emailed a proof before printing commences. When choosing this option, we will print the artwork that you provide. 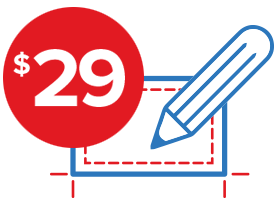 For $29 we will check, fix and provide a minor edit to your PDF artwork. Once we check, fix and edit your artwork as required, we will email you one proof for you to view and approve before we commence printing. You will be billed $29 once the proof is approved. Why should you order a proof? You want your PDF artwork checked (and fixed) so it prints correctly. You’re not confident that your artwork has followed all of our Artwork Guidelines. You need a minor edit to your artwork, such as a change in details or layout. You just want to see a preview of how your artwork will look when printed. What does a “minor edit” include? Changing the name and contact details on a business card. Fixing required specs, such as size, bleed and margins. Adding some extra details to your design. Adjusting the design, layout, colours etc. If your request for a “minor edit” will cost more than $29, we will provide you with an upfront quote so you can decide whether to proceed with the artwork edit. A check of your artwork specs including format, bleed and margins. A quick fix of any minor issues in your artwork. A round of minor edits to your artwork as required, such as change in contact details or edit to the design. One proofed emailed to you. Your email proof will show you how your artwork has been edited (if at all), and how your printing will be trimmed. Our skilled artwork technicians will also comment on any other issues or risks with your supplied artwork, which could save you a costly reprint. $29 provides 1 proof only, with Check, Fix and Minor Edit for 1 artwork only. Further edits and changes would require another $29 to be paid for a new proof. Extra sets / kinds of Business Cards (with different names on) would require one proof each, at $29 each. If your artwork requires more work than we can provide with a minor $29 edit, then we will provide you with an upfront quote for extra design work required. You have the option to not receive a proof, if you are confident that your artwork does not require a check, fix or edit. Be sure to follow our Artwork Guidelines and use our Artwork Templates for the best results. You can download a copy of all artwork that has been printed. Find your order, and click “More Details”. On the job screen you can then “View Artwork” and “Download”. Our professional Design Services provide you with full copyright of the design you approve, however the artwork working files, graphic files, fonts, source files and application files belong to us. We can provide a copy of working files with payment of an artwork release fee, typically $55. Artwork may be released at our own discretion. If you need an alteration to your artwork, then we can provide a minor edit from only $29, and then provide you with a print-ready PDF. 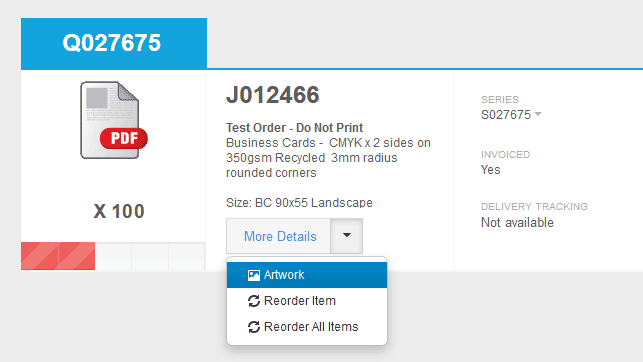 Once your printing job is ordered and paid for, you can upload your artwork file. Select “More Details” then “Select Artwork”. Then once you can see the artwork preview, click the “Confirm” button. Note, clicking “Confirm” too early (before the preview is visible) may cause upload to fail. If you are unable to delete uploaded artwork, it may be too late in the production process. Contact your Account Manager with the button below to check. Benefit from our experience in design and marketing for your printing, and get a quote today. We can help with your artwork! You will receive one email proof to view and check how your printing will look before you approve it for printing. We also offer a full range of professional design services including graphic design, logo and branding, advertising and marketing design. If you are submitting your own artwork for pritning, we have artwork guidelines for you to follow. We also have a range of artwork templates for you to download and edit in popular formats such as Adobe Creative Suite and Microsoft Office. Other files types such as Microsoft Office should be converted to a PDF before submitting. Please export your PDF in the highest quality available.